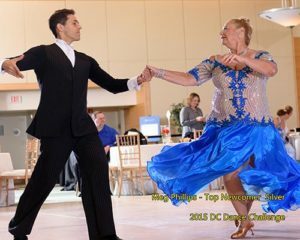 Would you like to see a short Ballroom demonstration with a couple of our Ballroom instructors, before you sign up for the Ballroom Classes? Click here! and follow, foot position, alignment, and poise in several different dances. Latin dances as well as technique like Cuban motion, body isolations, arm styling, turns, etc. Sign Up Online by clicking the class of your choice below (you will be re-directed to Glen Echo Park Website) or Register at Glen Echo Park at the 1st day of your class of choice. In the early 1800’s Waltz was introduced into the English ballrooms, this was, the first time society had seen this outrageous dance position, with the man holding the lady so close to his body. The church and the state denounced it for its vulgarity and immorality… But this very reason that brought Waltz such criticism, also made it appealing, and the Waltz was here to stay. Waltz is a smooth progressive dance characterized by long, flowing movements, continuous turns, and rise & fall. Graceful and elegant, Waltz dancers glide around the floor almost effortlessly. In contemporary ballroom dance, fast versions of the waltz are called Viennese waltz. International Standard Waltz has only closed figures; that is, the couple never leaves closed position. A typical Waltz figure (from the man’s perspective) starts lowered into the knees and travelling forward with a strong heel lead. Count 2 rises and is taken on the ball of the foot, and count 3 starts on the ball of the foot and lowers to the heel as the couple begins to lower in preparation for the next measure. A smooth rise-and-fall action is a primary characteristic of this dance. American Tango Unlike the Argentine Tango, in which the dancer interprets the music spontaneously without any predetermined slows or quicks, the American Tango features a structure which is correlated to the musical phrasing. The dance is executed both in closed position and in various types of extravagant dance relationships which incorporate a particular freedom of expression. This ballroom dance class will help you become a more powerful tango dancer. Learn basic tango figures and technique, including connection, poise, posture, footwork, and alignments. chasses ideal for social dancing. After this class you will be elegance personified! Experience basic flowing and graceful patterns and learn the techniques that will create that effortless look of a good dancer as: partnership, poise, posture, footwork, rise and fall, sway, and alignments. The Viennese Waltz is an old rhythm, having thought to have originated in southern Germany in the late 1700s as a peasant dance called the Ländler, characterized by a fast pace and rapid rotation. It came to Vienna during the 1800s and quickly became extremely popular throughout Europe and America. The Viennese Waltz is danced much faster than the Modern Waltz, up to twice as fast. This means that the rise and fall is more abrupt and more shallow, and steps are small and compact. Learn the tricks to dance Viennese Waltz comfortably, including connection, posture, footwork, rise and fall, and alignments. Rumba a slow, sensuous, romantic dance with much flirtation. Many of the basic figures of the dance have a “tease and run” theme in which the lady first flirts with and then rejects her partner. The sexual overtures can be very aggressive. The Rumba spotlights the lady and in particular her rhythmic body action and sexuality. The slow Latin beat, the rhythmic body and hip action, and the steamy tease and run figures result in routines that can be close to X-rated. Unlike the Cha-Cha which effects a happy, carefree, party-time-like dance expression, the rumba effects a more serious and intense expression. This class will consist of Rumba figures, and the techniques that make those figures look fancy, including rhythm walks, Cuban motion, spotting, connection, poise, posture, and footwork. Cha-Cha originally known as Cha-Cha-Cha, has its origins in the Cuban Mambo. It gets its name from the distinctive syncopated triple step (cha,cha,cha) danced between 2 rock steps. It came to this country in the middle 1950’s.The Cha-Cha is also a spot dance and is expressed though body animation. The character is fun, flirty, playful .Cha-Cha figures cross over to almost any fast tempo music from country to funk and hip-hop. Learn the basic figures and the technique that makes those moves really stand out on the dance floor, including rhythm walks, Cuban motion, spotting, connection, posture, and footwork. East Coast Swing also called The Jitterbug, is the official “sock hop” swing dance for jump blues. This is a fun dance! East Coast Swing is a circular, rotating swing dance that has many wraps, tunnels, and turns. The basic step is: triple step, triple step, rock step. The music is diverse and includes oldies (Elvis and Chuck Berry), jump blues, country, big band, and top 40. East Coast Swing is a versatile dance suitable for both the ballroom and the bar room. With a wide range of music to choose from you can swing to almost anything. Learn the basic footwork, partnering skills, and the techniques that will make feel good and look good on the dance floor. Forever Dancing Ballroom & Latin Classes near Lincolnia, VA; Jefferson, VA; Falls Church, VA; Annandale, VA; Arlington, VA; North Springfield, VA; Franconia, VA; Idylwood, VA; Springfield, VA; Alexandria, VA; Groveton, VA; Washington, DC; Tysons Corner, VA; West Springfield, VA; Vienna, VA; with the best Ballroom & Latin Instructors of the DC Metropolitan Area.